The NordicTrack A.C.T. Commercial Elliptical Is On Sale! On one of our visits to NordicTrack headquarters, our team was particularly curious to check out the NordicTrack Elliptical ACT Commercial as we were getting a number of questions from readers about this model. WEEKEND SALE ENDS MONDAY: The NordicTrack A.C.T. Commercial is no longer for sale from NordicTrack. We recommend you check out the FreeStride Trainer FS5i instead. Compact Design — Elliptical trainers can be space hogs. Some models have very long lengths, particularly front wheel designs. Of course, there are some very compact rear wheel designs, but they are usually cheap models that aren’t very stable. The center design condenses the mechanics and results in a machine that is only 51″ long. In comparison, the NordicTrack SpaceSaver SE7i front drive elliptical is 81″ in length. The SpaceSaver needs to fold up in order to “save space.” The ACT commercial can be left in normal operating configuration and still be smaller. That is why the NordicTrack Elliptical ACT Commercial is ideal for apartment and condo dwellers. 18″ – 22″ Adjustable Stride — The one flaw with an elliptical is that you need to find the right model with a stride length that suites your physique. For example, taller individuals will want to opt for a longer stride. If you have multiple users at different heights that can be an issue. With an adjustable stride individuals can find the right stride within their comfort zone. The other advantage of an adjustable stride is the fact you can change the stride length and focus your workout on different parts of your lower body. The adjustable stride provides more of a “full body” workout than an elliptical with a fixed stride. Very Stable — Particularly with cheaper elliptical trainers, you will find that they are very unsteady. They may tend to rock, especially during a strenuous workout or with a heavy user. The center drive ellipticals have a square base that contributes to a solid, stable feel. Advantage #1: You are centered over the motion. In comparison to the front design, you tend to have to lean forward when using the handlebars. We found the center design to be more natural in positioning and in the motion of the stride. Advantage #2: We also thought the position of your body in relation to the handlebars gave you a better upper body workout. One of our team members owns a front drive elliptical, and unless he makes a conscious effort to put pressure on the handlebars, his arms tend to just go through the motions. Our team thought the center drive did a better job of distributing the resistance and the benefits. Pedal Distance — One additional advantage to the center design of the NordicTrack Elliptical ACT Commercial is the pedal distance. They are closer than many models. This is an attractive feature to females of average to below average height. Many complain about the discomfort of the pedal distance of many front and rear drive ellipticals. iFit Ready — With iFit Live you have the several motivational features that make exercising in place more exciting. First, you can create a fitness goal profile at iFit.com and an 8-week workout routine with audio coaching will be downloaded onto your elliptical. Your specs are downloaded onto your iFit.com account, allowing you to track your progress. In addition, you can map out a route on Google Maps and the NordicTrack A.C.T. Commercial elliptical will simulate the terrain by adjusting the resistance. You can view your progress with a laptop, tablet, or smart phone. Slots are available on the console to place your tablet. This feature requires WiFi and the purchase on a iFit module. 23 lb. Flywheels — The ACT Commercial has a 23 lb flywheel giving the elliptical motion a smoother and more natural feel. Oversized Gel Pedals — The oversize pedals allow you to better position your feet for better comfort. The gel reduces impact and decreases the chances of foot numbness. Cooling Fan — According to the staff at NordicTrack this feature is very popular with their customers. 32 Workout Programs — The various programs adjust the resistance of the elliptical to focus on aerobic, weight loss, or performance goals. It gives you variety and helps to motivate the users. Sound System — NordicTrack offers some of the best sound systems found on any fitness equipment. You can plug-in MP3 players. Heavy Unit Weight — The NordicTrack A.C.T. Commercial weighs in at approximately 240 lbs., giving it a very stable and solid feel. Warranty — The warranty comes with LifeTime Frame, 3 yrs parts, and 1 yr labor. This isn’t bad for a $999 elliptical trainer. We were surprised there are not more center drive versions of elliptical trainers. They benefits are obvious. When testing the NordicTrack A.C.T. Commercial we found it to be solid, stable and it runs quieter than most elliptical trainers at this price range. It can accommodate users of different heights, and it appears to be durable enough to handle multiple users. In fact, a prominent consumer magazine gave it a “Very Good” rating for construction. This model has been out for several years, and they keep bringing it back because it is a big hit with customers. 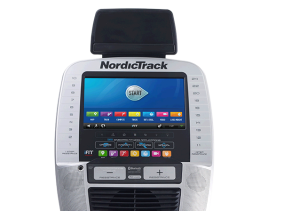 If you are willing to spend an extra $500, you could also check out the NordicTrack ACT Commercial 10 model. The ACT Commercial 10 improves upon the original ACT Commercial with a heavier 25 lb flywheel, a 10″ Web Enabled Touchscreen, a wireless chest strap included with the purchase and a stronger 5 yr parts/ 2 yr labor warranty. Check out a complete comparison chart of all NordicTrack ellipticals on our site here. For more information go to NordicTrackEllipticals.com. Where can I get another instruction book or papers that come with this machine. Ive had mine a number of years and seem to have misplaced my paper work that came with the machine. Please let me know how I can get another copy of the instruction ..explanation of machine papers. I would greatly appreciate it. Thanks. If you contact NordicTrack directly, their service department should be able to advise on replacement manuals.